The Mourner's Bench, also called an anxious bench, was a ritualized prayer technique used extensively by nineteenth-century Christian revivalists. Aimed at securing the immediate and dramatic conversion of sinners, the technique originated as part of the "New Measures" conceived by New York's Charles G. Finney-perhaps the most influential revivalist of the so-called Second Great Awakening. Beginning in the 1820s, Finney traveled to large New York cities and towns, successfully spreading his own brand of aggressive, high-energy revivalism. Finney's strategies, unique at the time, included direct and powerful sermons; long, intense prayer meetings; greater female involvement in public services; the calling of individuals in need of repentance by name; overtly familiar references to God; and the insistence upon obvious, often physical "proof" of conversion. 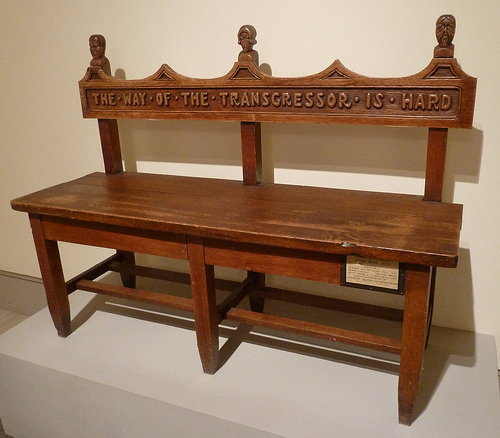 The mourner's bench, and later the altar call, helped carry the conversion process to a climax. Finney's New Measures, although controversial among many traditional Protestant churches, became a model for rural revivals and camp meetings throughout the 1800s and early 1900s. In North Carolina, widely attended camp meetings such as those at Town Creek near Wilmington, Wesley Chapel Camp Ground and Balls Creek Camp Meeting in Catawba County, and Shepherds Crossroads in Iredell County all featured a mourner's bench in one form or another. At such gatherings, the mourner's bench was usually placed in the center of the congregation, adjacent to the pulpit and in plain view of everyone present. The "bench" might be several plain wooden benches, a few chairs, or perhaps just an enclosed area without seats. People went to the mourner's bench when they considered themselves finally ready to abandon a life of sin and step unfalteringly toward eternal salvation. Intense praying, exhortations by the preacher and other previously converted Christians, crying, singing, proclamations of guilt and shame by the "convicted," and occasional spiritual exercises (such as the "jerks" and speaking in tongues) often accompanied the transformation. In the end, the experience was both a personal journey from unbelief to faith and a public declaration of a commitment to change one's life. Whether the result of intense psychological coercion, as some suggest, or evidence of a real spiritual conversion, the drama elicited by the mourner's bench was an essential part of the nineteenth-century revival experience. Guion G. Johnson, "The Camp Meeting in Antebellum North Carolina," NCHR 10 (April 1933). Thad Stem Jr., "Those Revivalists of Another Era," Raleigh News and Observer, 4 Sept. 1966.